Goblins and ghoulies, candy corn and cornstalks, doggie costume contests and parades: It’s time for dogs to get a scary groove on and don the Halloween garb. 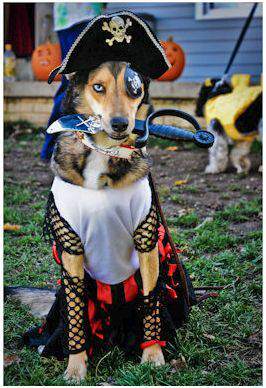 Ever wish your pooch could win a dog Halloween costume contest? Did you ever dream of having your dog win a prize in the local parade, online photo contest, or pet event? I’ve judged and entered dozens of dog Halloween costume contests, so I know there are throngs of dog lovers, myself included, who love dressing their canines in spooky, fun, and festive attire each Halloween season. If Fido is wearing a costume, make sure he likes it, that it’s comfortable, and that he is familiar with walking in it. Never make a dog dress up if the dog is not happy about it. One sure way to lose is a contest is to put a dog in a costume where he is unhappy, uncomfortable, and just generally not pleased with the situation. My dog wears clothes and is used to it, so this was an easy transition for me. My previous Cocker Spaniel was a year-round clothes wearer for the nearly 15 years she shared this life with me. Modify a human concept costume so that Fido gets in on the festive conversation-starting fun. A concept costume is the type that makes people think and perhaps even speak it aloud, to “get it.” Take a pun and maximize it. For example, I won first place at two events to benefit rescue in the past with my dog, Dexter’s, costume. Check out the photo below and try to figure out what he is before scrolling down. Note the elements of the costume to guide you in figuring it out. Can you guess what Dexter is dressed as? Ideas: Candy wrapper: Dress Fido in a dog-friendly t-shirt, glue a variety of candy bar wrappers on the outside and bling a dog out with gold-tone beads. There you have a “candy (w)rapper.” Got the idea? One caveat: Don’t make it too difficult to figure out. Ever see a dog dressed as a squirrel? A dog dressed as a cat? People love opposites, and by “people” I also mean judges. A little nutty costume for the dog. It’s an election year, so you can always enter a contest as President Obama and first dog, Bo. Be certain the contest criteria has a dog-owner costume category. Who is hip and in and would make a clever costume? I met this gang at a Halloween costume contest in 2010 and they dressed their Chihuahuas as members of the Jersey Shore television show (with the owner resembling Mike “The Situation”). They won first place. Or check out Michael “Cocker” Jackson from Patty Troup. Love the glove! 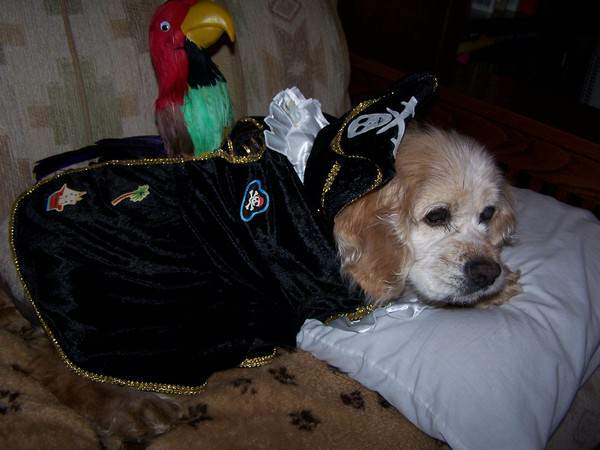 When my dog was a pirate for Halloween, I cut and modified a child’s size pirate costume and added a parrot purchased at Party City for $5.99. I super-glued that on and she was the most unique pirate in the parade. This is my late dog, Brandy, eternally missed. Dressing with your dog theme-wise –- this can go either way; if your dog has a caveman costume and you are the cave woman, that is way cute. Stage moms and dads beware, these contests are for the dogs. Complement the dog’s costume, don’t overshadow it. Your dog needs to enjoy it and not look uncomfortable -– the people constantly adjusting something Fido clearly isn’t happy in won’t (and shouldn’t) catch the judges eyes or votes. When my Brandy was a clown, I added balloons and played “It’s a Small World” on a tape recorder I held in my pocket (yes, the tape recorder days). She won first place, and there were several clowns there. I used a dog’s polo shirt I found at a pet supply store for $6.99 and used it as a base for Dexter’s “cereal killer” costume. Take a familiar costume and improve it: Clown costume with a makeshift boa; witch costume and when you walk by the judges, spooky cackling sounds emit from a tape recorder in your pocket. As promised, here’s Dexter in his costume last year. I never enter for the prizes and always donate them to someone else in the parade. I just love Halloween and being creative. Any guesses? Let us know in the comments section. Are you entering your dog in any online or in-person contests this year? We’d love to hear your ideas, and even better, SEE the pictures. Be sure to enter the Fidose of Reality dog Halloween photo contest for prizes now. 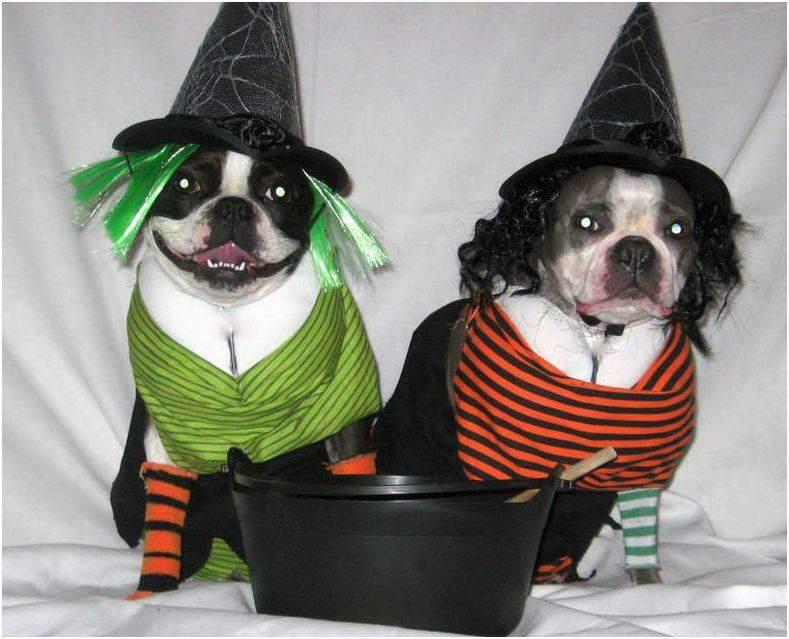 i do both, one yr, but i did know, my girls were featured on the petco page for halloween. we have won many awards and prizes, but mostly in person, i have a trunk load of costumes, 2 yrs ago we were the 3 blind mind and the butcher’s wife. this yr going as goldielocks and the 3 bears. i have won at the spca event 3 out of the past 4 yrs, the yr we did not win, the contest was too full, so could not enter. one yr at the assisted living center, when my mother was alive, i dressed her and evie, my oldest, then only child, as pirates, they won…it was so cute seeing them walk together down the aisle. evie was so good to my mother…we make the rounds during halloween, go to all of the pet stores. When Neeko was about 8 months old, we won a costume contest with her. We dressed her as Little Red Riding Hood, and people loved the irony. We used a child’s costume kit. My Momma didn’t get me a costume last year, but she did get me a Halloween related shirt. This year she’d like to dress me up, but was what is still up in the air! It took Momma and me a minute to figure out last year’s costume, but we think we’ve got it! Did Dexter go as ‘A salt and battery’ ?! Each costume is better than the next. I especially like the Chia pet, but which dog won the contest? Well — that looks like Assault and Battery to me!!!! Very clever!! And Citizen’s Arrest — just like Barney Fife!